Animal Massage is a fast-growing, in-demand modality of massage that therapists are quickly choosing to learn and practice. Primarily including cat massage, dog massage and equine massage therapy, many practitioners study all three. Like us, our pets have feelings of pain, fear, loneliness, stress, confusion and love. Also like us, their feelings are based on what they have experienced earlier in their lives and of their memories of things that have happened to them. Studies show that when animals are not touched, they start to feel unloved and unwanted. Animals that are touched show more love to their owners, appear happier and healthier, and are easier to train when they are young. Therapists can learn small animal bodywork (like dog massage and cat massage), large animal bodywork (like equine massage therapy), and how to use aromatherapy, shiatsu, acupressure and stretching techniques that enhance their performance. With the same healthy benefits as humans receive, this treatment has been proven to increase flexibility, reduce pain in stiff joints, improve circulation, and improve performance in animals that are in competition. Equine massage therapy practitioners, or horse practitioners can make well over $100 per hour and dog massage therapists / cat massage therapists make around $45-$75 per hour, depending on the experience level and location of the therapist. Hands On - Canine Therapeutic Massage for Sports and Pet Dogs teaches how to do animal massage for your pet in your own home. This DVD concentrates on dogs, but can be used on any pet. Although massage cannot cure medical problems in our pets, it allows the body functions to improve in the animal, which allows healing from the inside out. Massage reduces swelling, and decreases muscle spasms, tension and excessive scar tissue in animals. It increases muscle tone, while relaxing the nervous system and decreasing energy expenditure, which improves the body's movement. This allows the animal to be a happier, healthier athlete or pet who can perform to the best of their ability for a long time. Cat Massage - teaches owners how to massage their pets to relieve physical and mental issues that cats may have, like nervousness, aggression, or arthritis. 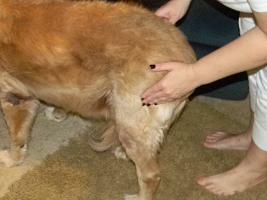 Dog Massage - helps dogs by calming the nervous system, increasing circulation, and aiding digestion. As preventative therapy for dog and horse competitors, massage keeps muscles in good condition, helps detect muscle injury and reduces time needed for rehabilitation after injury. After injury, massage helps speed healing, usually dramatically reducing time needed for repair and rehab. When bones are broken, massage helps support muscles around injured bones to encourage healing. After giving birth, animal massage helps to heal overworked muscles of female animals, while relieving lower back pain and weakness. Older horses and dogs need massage as it increases circulation of blood. This prevents discomfort and stiffness, as well as hlping muscles perform at their best. Nervous dogs and horses will love relaxation massage, making daily tasks or competition less stressful. A calmer animal can focus better after the massage, making movement easier.